I had a brainwave this week at the local game shoppe. As a bit of a writer, I find it almost imperative that I write about things as they appear on my radar. The process helps me to sift through my thoughts and then sharpen them once they’re submitted for public approval. But where to share these thoughts on our favorite card game? There’s no lore involved so it can’t go on Master of Lore. It’s a little too specific for my oft-neglected personal blog, so it falls here to the Grey Company. We were attempting to riddle out Celebrimbor’s Secret at the shop last week, unsuccessfully I will add, when I mentioned how the quest is kind of a puzzle. ‘That’s it!’ exclaimed a fellow player. ‘It is a puzzle!’ The tone was pejorative, as if to say: this isn’t a game, it’s Sudoku. That’s when it hit me. Yes, it is a puzzle and we have to tailor our decks accordingly, but isn’t it that way with most card games? Fantasy Flight just had their LCG World Championship, as did Hearthstone. There are thousands upon thousands of Magic tournaments in game shops across the country each week. In all of these competitions it’s imperative to have some idea what your opponent is playing and to plan according. If you know card X is coming, you don’t play card Y until you see it or you believe that they haven’t drawn it. The same is true of The Lord of the Rings: we have to know our opponent’s (the encounter deck) cards and plan for it. In our case we know exactly what our opponent is playing, but he is still playing an overpowered deck that severely bends the rules and that is frustrating to say the least. The issue is that sometimes we just don’t want to do that. We’ve said on the show on many occasions that we don’t always have the time (or desire for that matter) to custom build decks to ‘solve’ quests, especially with the current cycle in which it feels like our decks have to do it all and do it all well. That is a different story altogether, but the realization that the encounter deck (1) is an opponent and (2) an opponent that can be beaten has been helpful in confronting it. While sometimes that opponent seems formidable, even impossible, we have the tools necessary to solve the problem and crush the enemy and that, really, is when this game is the most satisfying. Stay tuned! A Celebrimbor’s Secret fail video is on the way and new episodes are in the pipe. 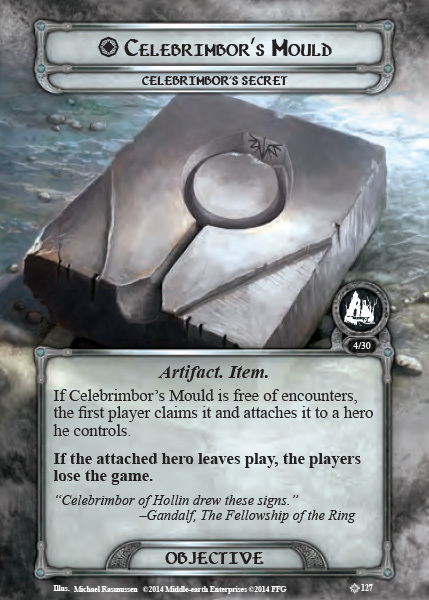 This entry was posted in Blog Entries and tagged blog, LOTR LCG, ring-maker cycle. Bookmark the permalink. I noticed this a long time ago with regard to video games. I belonged to a club that published a fanzine (yeah a long tme ago) about boardgames. They did not cover video games as they “were about games not puzzles”. Obviously this was before the massive rise of PVP gaming. I pondered this in regard to my own affection for video games & distaste for puzzles. I figured out what I considered a tactical game was one where I could learn how to play in general terms & apply the skills I had learned to different situations. Some games on very hard difficulty settings require such precise lines of play that they do have more of the character of a puzzle than a game, in my sense. In relation to LOTR TCG I like to build a deck that can handle a bunch of quests – say a whole cycle or all the sagas in one thread. If I am doing this I feel I am playing game. If I have to build very specific decks to deal with a quest, say Return to Rhosgobel, then I feel I am solving a puzzle instead, which I don’t like :p.
Hi Jonathan, I find it is the same in all CCGs and LCGs. Your opponent is presenting you a puzzle. That is, I have weakness as well as strengths. Find one of these weaknesses, exploite it and you can beat me. So the puzzle aspect of the LOTR LCG may not be the key to your issue with it. I’m thinking you’re really talking about how it can be an real investment in time to build new synergistic multiplayer decks with every quest. I can understand this, especially if you like the multiplayer interaction, and deck building is a often a solitary process. Am I close to the mark on this?